CTi braces are medical grade products, covered by most insurance plans with a doctor’s prescription. Whether custom or off-the-shelf, every CTi ligament brace benefits from the input of medical professionals and feedback from professional surfers. The resulting brace is the perfect blend of support and function, designed to help you rehab and ride safely after a knee injury. A basic frame design that functions well for surfing. The CTi is the only ligament knee brace that captures the tibia, locking down securely on the tibial crest. 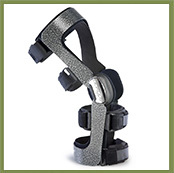 The rigid upper and lower arms combine with the hinges, condyle pads and straps to properly align the knee joint and provide an accurately-tracking exoskeletal upport. CTi can be ordered with an Anti-Migration System (AMS) at no additional charge. This comfortable neoprene padding configuration virtually eliminates brace lippage, eliminating the annoying hassle of having to constantly adjust your brace in the water. Streamlined frame shape and hinge design (especially on the medial side) contour closely with the leg. This keeps the brace very low-profile and limits the rag in the water when paddling and snapping up on waves. CTi can be used with wetsuits. Simply remove standard padding from brace (attached via hook and loop) and apply the brace over the top of the wetsuit. The wetsuit replaces the padding. Non-corrosive materials make the CTi ideal for surfing. Simply rinse out with fresh water after use in the ocean. CTi can be manufactured to be shorter, longer, thicker or thinner based upon your height and weight. The CTi OTS ligament knee brace provides a high level of protection and support with off the shelf convenience. 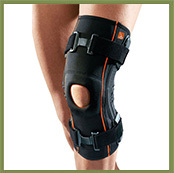 The brace is indicated for ACL, MCL, LCL, PCL, rotary and combined instabilities of the knee. It is designed with a rock-solid CTi carbon frame and outfitted with anatomically correct Accutrac hinges and flexible cuffs and buckles. 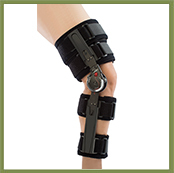 Thus, providing a rigid exoskeleton that stabilizes the knee joint. The Custom CTi is similar to the CTi OTS but is designed according to the exact contours of the patient. The Custom CTi also provides the ultimate combination of stabilization and protection of the injured knee joint. The CTi custom knee braces are available in 3 models: the Vapor, Standard and ProSport and can be further customized with a variety of options, colours, designs and/ or accessories. 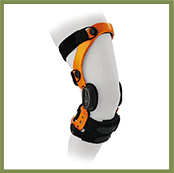 DonJoy Defiance sets the industry standard for custom made knee braces. A host of options allows customisation of the fit and functions, to ensure maximum protection and confidence. It has become the market leader in technology, materials and design. Defiance incorporates DonJoy’s patented 4 Points of Leverage for effective support, and offers a choice of patented hinge design. Moderate to severe ACL, PCL, CI, MCL and LCL instabilities. The OA Defiance is suitable for the active patient with osteoarthritis. Patella donut maintain patella in correct position. Donut can be trimmed to provide tailored patella misalignment correction. Removable aluminum polycentric hinges offer medial / lateral stability. Encased hinges for protection from lateral impacts (ideal for sports use). Soft, anti-pinch posterior lycra panel enhances comfort. Breathable, form-fitting 5 mm spacer mesh material promotes airflow. Fit Left or Right knee. The New Reaction Knee Brace is an active, responsive, webbed approach to general anterior knee pain, and a distinct alternative to basic knee sleeves. Designed for immobilisation and protected range of motion associated with post- traumatic treatment, ACL, PCL, LCL and MCL surgeries, patella realignment and meniscal or articular repairs. The DonJoy Armor knee brace provides athletes involved with contact and extreme sports a knee brace with uncompromised strength that will provide proven protection of the knee joint. It is designed with a steel reinforced hinge plate for extra strength while the low profile FourcePoint hinge and internally mounted straps promote bilateral use that won’t impede performance of the athlete. 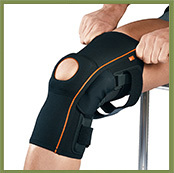 A tubular knee brace with polycentric hinges and a patella stabilizer. Made of AirX breathable material. A popliteal insert for increased comfort. Patella opening with a patella stabilizer in foamed material. Brackets in flexible material fixing the hinges and guiding straps. Mild to moderate latero-medial instability. 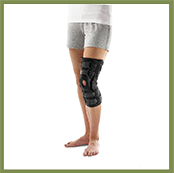 Protection from abnormal tension in an injured knee while healing. Mild instability of patella and patella-femoral arthrosis. A tubular knee protector with spiral rods and a patella stabilizer. Knee braces are designed to transfer load while allowing for normal knee function and are designed for prophylactic or functional use. Prophylactic knee braces can be used for most sports and are typically used to stabilise the knee in the coronal and sagittal planes of movement to prevent straining the MCL (medial collateral ligament) and LCL (lateral collateral ligament) and ACL (anterior crutiate ligament). Functional knee braces are designed and used to prevent recurrent instability in patients with ACL (anterior crutiate ligament) or PCL (posterior crutiate ligament) tears. The majority of the functional knee braces are designed to protect a patient with an ACL-deficient knee or to protect the ACL reconstructed graft while returning to full activity. 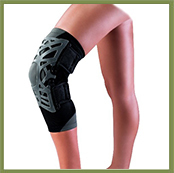 Knee braces are available off-the-shelf or are custom fabricated. Both have proven to be effective if the geometry of the braces matches the geometry of the extremity. 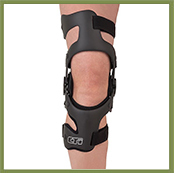 Off-the-shelf braces are designed based on the approximate geometry and length of the individual’s knee. Therefore we recommend that you/the patient should try different braces from different companies in order to determine the best fit and function.